Located in the Multinationality Autonomous County of Longsheng in the northeast of the Guangxi Zhuang Autonomous Region, the Longshen Hot Springs National Forest Park is 110 kilometers from Guilin. The park embraces dense forest suspension bridges and the Huaping Nature Reserve known as a "botanical treasure house" ,. The silver fir, a rare plant called a 'living fossil", can be found in the forest in Huaping. 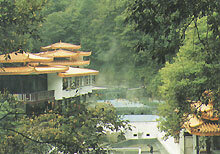 The long sheng Hot Springs, surrounded by green mountains, is an ideal summer resort, a place for convalescence, a health-building center and a tourist attraction, with fresh air and pure water- cool in summer and warm in winter. Adjacent to the park are Zhuang, Yao and Miao villages, where the hospitable minority people welcome tourists with songs and dances. 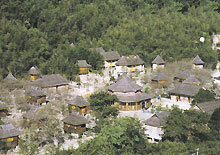 Visitors may feast their eyes on ancient elegantly made ethnic architecture, such as the "wind-and -rain" bridges and drum towers of the tong people, wooden buildings of the Zhuang, stilt houses of the Miao and unique homes of the Yao.